False killer whales are so named because the shape of their skulls, not their external appearance, is similar to that of killer whales. Reaching up to 6 meters in length, the species behaves much more like a smaller dolphin, swimming quickly, occasionally leaping, and sometimes approaching whale watching vessels. Photo courtesy of Paula Olson/PIFSC/NOAA. False killer whales are closely related to, and easy to confuse with pygmy killer whales, melon headed whales, and pilot whales, particularly young pilot whales. Pilot whales can be distinguished from false killer whales by their bulbous heads and more foreword-placed and broader and rounded dorsal fins. Pygmy killer whales and melon-headed whales are both smaller than false killer whales, have larger dorsal fins in proportion to body size, distinctive white ‘lips’, and do not have the sharp bend or ‘elbow’, in the flipper that is characteristic of false killer whales. False killer whales are generally found in tropical and temperate waters between latitudes of 30° and 30° N. They are uncommon and poorly studied in most regions. While they appear to occur more frequently in deeper open ocean waters, they can occasionally move into nearshore areas. 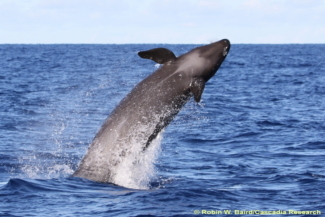 False killer whale leaping in Hawaii, showing off the bullet-shaped head, pale chest-patch, and distinctive ‘S’ shaped flippers that are characteristic of the species. Photo courtesy of Robin Baird, Cascadia Research. False killer whales feed on a variety of fish and squid, sometimes taking large fish species like mahi-mahi, tuna, and other predatory fish like sail fish1-4. These feeding habits often bring them into contact with longline and other hook and line fisheries targeting these large fish species, and put them in conflict with fishermen when they steal fish from the lines (a phenomenon called depredation)5-7. While false killer whales have been known to attack and consume other small dolphin species as these are being released from purse seine nets in the Eastern tropical Pacific, and may harass other larger whales, they are more often seen associating with other dolphins in a non-aggressive manner. In New Zealand they are known to form long term associations with bottlenose dolphins8. Like Killer whales and sperm whales, there is evidence that false killer whales form stable family and social groups4,9,10. False killer whales studied in Hawaii remained around the island chain for a minimum of 20 years and stable associations between individuals were confirmed to last at least 15 years10. Both males and females are thought to be able to start reproducing at between 8 and 14 years of age11, and individuals may live as long as 60 years or more. Unusual for marine mammals, females that no longer produce calves continue to play a role in family groups, possibly looking after the young of other females in the group12. False killer whales produce calves only once every 6-7 years, an indication of the maternal investment required to raise their young. Also unusual, false killer whales conduct prey-sharing, a behaviour thought to reinforce social bonds9. 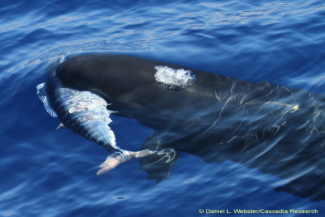 False Killer whale in Hawaii with Wahoo/Ono prey. Photo courtesy of Daniel Webster, Cascadia Research. False Killer whale mother and calf in Hawaii. Photo courtesy of Robin Baird. There is little documentation of predators taking false killer whales, although a killer whale attack was observed in New Zealand. At least two false killer whales in Hawaii carry scars from large shark bites, indicating that large sharks target the species from time to time1,9. The species has been involved in several mass strandings throughout its range13-15. False killer whales are often viewed as a nuisance or as competitors by fishermen, particularly when they steal target fish from longlines, which they are known to do in Japan, Hawaii, the Indian Ocean and the Gulf of Mexico 1,2. This has led to direct hunts or kills in some fisheries, including in Japan, St. Vincent and Taiwan. 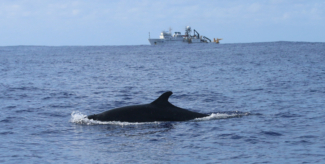 The species is also prone to unintentional entanglement or injury in fisheries gear, which is thought to be unsustainable in the false killer whale population around the Hawaiian islands6. Bycatch in other fishing gear such as drift nets and purse seines also occurs, and pollutants, as well as depletion of their large predatory fish prey are thought to present threats to false killer whales around the globe2,16. Due to their predominantly offshore distribution false killer whales are difficult to study and not many populations have been assessed. As such, the species is designated as Data Deficient on the IUCN Red List of Threatened Species2. The species is not listed on either Appendix of the Convention on Migratory Species (CMS). There is serious concern, about the false killer whale population around the main Hawaiian islands, which was thought to number between 150 and 200 individuals in 2012, demonstrating a decline since 1989 10,17. As such, this population is designated as Endangered under the US Endangered Species Act. False killer whales are not frequently the prime, or sole target of whale watching activities, but they are often encountered on whale watching tours off Oahu, and less often off Maui/Lanai and Hawaii Island in the USA. They can be highly entertaining to watch, as they often leap and can be observed feeding on large game fish. They can also be curious and sometimes approach vessels to bowride1. False killer whale with research vessel in the background. The distinctive nicks and scars on the trailing edge of this dorsal fin would allow researchers to identify this individual whale if it is photographed again. Photo courtesy of Paula Olson/PIFSC/NOAA. False killer whale, photo courtesy of Robin Baird, Cascadia Research. Baird, R. W. False Killer whale, Pseudorca crassidensin Encyclopedia of Marine Mammals (eds W. Perrin, B. Wursig, & J.G.M. Thewissen) 405-406 (Elsevier, 2009). Taylor, B. L. et al. Pseudorca crassidens in IUCN Red List of Threatened Species (http://www.iucnredlist.org/det... Consulted on 9 October 2017, 2008). Weir, C. R. et al. False killer whale (Pseudorca crassidens) sightings in continental shelf habitat off Gabon and Côte d'Ivoire (Africa). Marine Biodiversity Records 6, doi:10.1017/S1755267213000389 (2013). 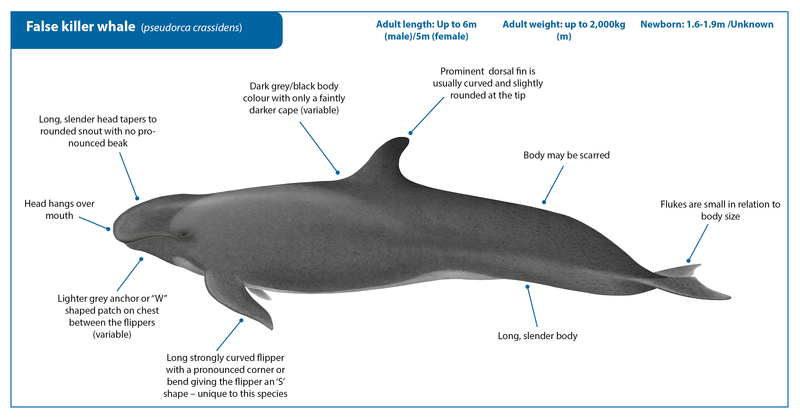 Baird, R. W. False Killer whale, Pseudorca crassidens in Encyclopedia of Marine Mammals Vol. Third Edition (eds B Würsig, J.G.M. Thewissen, & K.M. Kovacs) 701-705 (Academic Press, Elsevier, 2017 ). 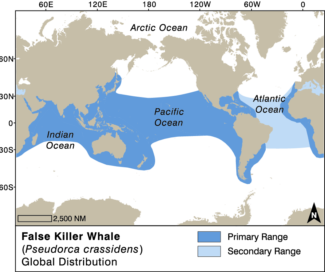 Anderson, R. C. Cetaceans and tuna fisheries in the Western and Central Indian Ocean. International Pole and Line Federation Technical Report 2, 133 (2014). Baird, R. W. & Gorgone, A. M. False Killer Whale Dorsal Fin Disfigurements as a Possible Indicator of Long-Line Fishery Interactions in Hawaiian Waters. Pacific Science 59, 593–601 (2005). Passadore, C., Domingo, A. & Secchi, E. R. Depredation by killer whale (Orcinus orca) and false killer whale (Pseudorca crassidens) on the catch of the Uruguayan pelagic longline fishery in Southwestern Atlantic Ocean. ICES Journal of Marine Science 72, 1653-1666, doi:10.1093/icesjms/fsu251 (2015). Zaeschmar, J. R. et al. Occurrence of false killer whales (Pseudorca crassidens) and their association with common bottlenose dolphins (Tursiops truncatus) off northeastern New Zealand. Marine Mammal Science 30, 594-608, doi:10.1111/mms.12065 (2014). Baird, R. W. The Lives of Hawaii's Dolphins and Whales: Natural History and Conservation. 352 (University of Hawai'i Press, 2016). Baird, R. W. et al. 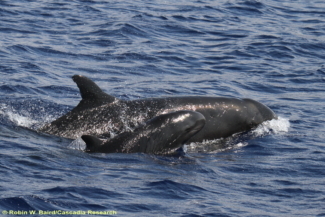 False killer whales (Pseudorca crassidens) around the main Hawaiian Islands: Long-term site fidelity, inter-island movements, and association patterns. Marine Mammal Science 24, 591-612, doi:10.1111/j.1748-7692.2008.00200.x (2008). Ferreira, I. M., Kasuya, T., Marsh, H. & Best, P. B. False killer whales (Pseudorca crassidens) from Japan and South Africa: Differences in growth and reproduction. Marine Mammal Science 30, 64-84 (2014). Photopoulou, T., Ferreira, I. M., Best, P. B., Kasuya, T. & Marsh, H. Evidence for a postreproductive phase in female false killer whales Pseudorca crassidens. Frontiers in zoology 14, 30 (2017). Kirkman, S. P., Meyer, M. A. & Thornton, M. False killer whale Pseudorca crassidens mass stranding at Long Beach on South Africa's Cape Peninsula, 2009. African Journal of Marine Science 32, 167-170 (2010). Haro, D. et al. A new mass stranding of false killer whale, Pseudorca crassidens, in the Strait of Magellan, Chile. REVISTA DE BIOLOGIA MARINA Y OCEANOGRAFIA 50, 149-155 (2015). Jefferson, T. A., Webber, M. A. & Pitman, R. L. Marine Mammals of the World: a Comprehensive Guide to their Identification. Second Edition. (San Diego: Academic Press, 2015). Foltz, K. M., Baird, R. W., Ylitalo, G. M. & Jensen, B. A. Cytochrome P4501A1 expression in blubber biopsies of endangered false killer whales (Pseudorca crassidens) and nine other odontocete species from Hawai‘i. Ecotoxicology 23, 1607-1618, doi:10.1007/s10646-014-1300-0 (2014). 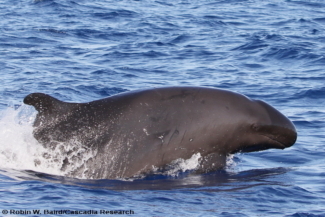 Reeves, R. R., Leatherwood, S. & Baird, R. W. Evidence of a possible decline since 1989 in false killer whales (Pseudorca crassidens) around the main Hawaiian Islands. Pacific Science 63, 253-261 (2009).